Last year I got the opportunity to design a pattern for Stitch Mountain, the unique book that paired winter sports athletes with knitwear designers and resulted in beautiful garments and accessories tailored toward those cold days on the slopes. Though I am a hopeless skier myself (not to mention snowboarding, I've never even tried that! ), I love watching the superb talent these athletes demonstrate each time they compete! My design in Stitch Mountain, the Twisted-Stitch Mitts, was inspired by Marco Sullivan, an amazing downhill skier based in the Truckee/Lake Tahoe area. 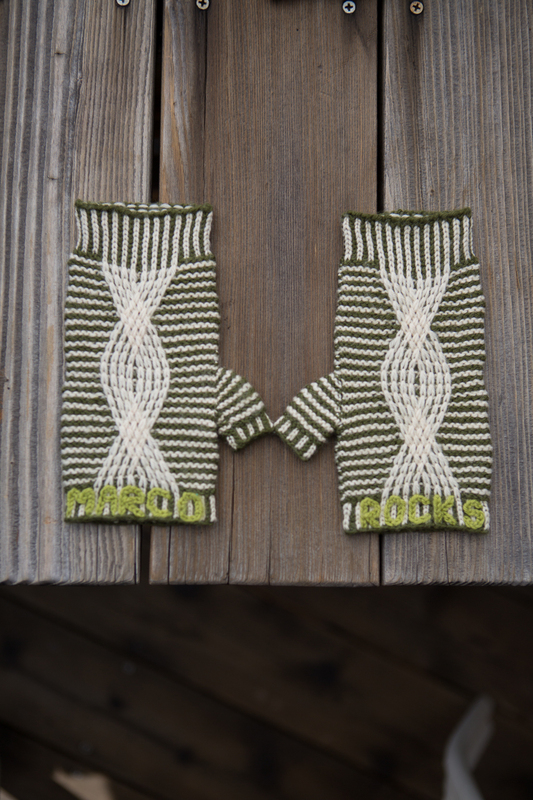 Since I am somewhat local here in Reno and certainly love spending time up at the lake I was super excited to take on the challenge of designing a pair of green and white fingerless mitts as requested by Marco. I started with corrugated ribbing at the cuff and then moved into the ever squishy and warm garter stitch stripes for the body. This allowed a traveling slipped stitch design to feature prominently in the design. I was inspired by the tracks left by skis in the snow, which is how I came up with the woven trails stitch pattern for the back of the hand. Finally, Marco has a large fan base that all wear green and white hats that say "Marco Rocks" on them so he also wanted the fingerless mitts to say this across the knuckles. It was easy enough to embroider this in a third, contrasting color across the corrugated ribbing. Using Rowan Pure Wool 4-ply, I chose a dark green and cream for the body and a bright lime green for the embroidery, which is a more earthy spin on the stark green and white of the "Marco Rocks" hats, but which suited my color sensibilities perfectly! As an added bonus, the incredibly talented photographer, Brad Swonetz, managed to find a fence post with the *perfect* color lime green moss on it to take the photos. 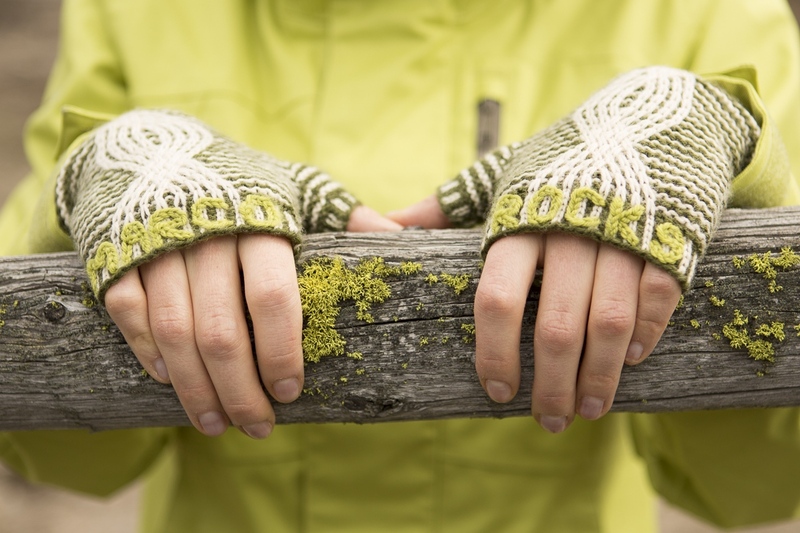 That combined with the model's jacket (also the perfect shade of lime green) makes a gorgeously composed photo that really brings out the color of the mitts. They did such an amazing job with all the photography, but I must say this is my favorite of the photos. I'm not biased, right? This was a super fun project to be involved in and I am so grateful to be included in Stitch Mountain. I encourage you all to go take a look at all the gorgeous patterns in the book. Some of my favorites are the Diamond Cowl by Kristen Ashbaugh-Helmreich, the Podium Pullover by Sally Melville and the Slouchy Socks by Gwen Bortner, but I've seen all the designs in person and they are all beautiful! Today, on the Stitch & Unwind blog by AllFreeKnitting.com, you can win a bouquet with all the yarn you need to make the Twisted-Stitch Mitts, as well as your very own copy of Stitch Mountain. Check it out for this giveaway as well as many others for the rest of this month!